Interested in applying for Lead Pastor position? Send e-mail to Pastor Search Committee. We are moving along in the Lead Pastor search process and we are right on track for the time table we set forth on this. Applications are being received through Vanderbloemen Search Group and the initial screening process has begun. search for a candidate who reflects His character. This week we need to pray for clarity. Clarity is the key to our search process. As we transition to a new lead pastor, we need to think through where we have been, where we are going, and how we want to get there. This kind of thinking requires trust. I tend to think of Abraham when I think of trusting God. Abraham trusted God when moving to an unknown place. He did this by keeping his eyes on God and following Him into the unknown. The time is near when your Pastor Search Committee will begin receiving and evaluating applications from candidates. This is an exciting time. This is the time we really need to lean on God for his wisdom and discernment. We need to remember that God has a perfect record in choosing those who will lead, to accomplish His plan. He's never been wrong before, and we should place our full trust in Him to lead First Free Church into the future. Prayer requests: (1) Pray that the Search Committee will hear God's voice with clarity and feel peace as they discern whom they should interview. (2) Pray that as the Search Committee reads applications, listens to sermon samples, and talks with candidates, they place our church's needs and desires before their own. (3) Pray for a smooth transition for Pastor Mark and his wife Cindy. David knew from an early age that he would be King. But even as he went through many trials through the years, he waited on God’s timing. David knew that waiting on God’s timing and plan for his life was worth the postponement of his own plans. This is how we, as a congregation, need to follow David’s example. We know that God has already selected our new lead pastor. God is not surprised by anything. And now it is our turn to wait on Him to reveal this man. Our responsibility: This is not a “pray if you want to” situation. God expects every one of us, staff, elders, and congregation, to pray. Prayer requests: (1) Pray that we will fully seek His plan for our church, (2) Pray that He will be glorified through this process, (3) Pray that we stay unified and obedient in the journey. And most importantly, to remember that He’s got this! Our God is a god of order. He is a god of structure. Nothing surprises Him. He knew the man that is to become our lead pastor, before the creation of the world was even completed! This thought should help put our minds at ease, right? But I am reminded of the Israelites. The Israelites had been in captivity for 400 years and finally freedom came. But then they wandered in the wilderness for 40 years. They were fearful. They wanted stability. They wanted peace. They wanted answers and they wanted a conclusion. The process to find our new lead pastor seems endless, daunting, and disconcerting. We all just want to know who he is, how he will lead us, and where we will go from here. We must remember that Jesus is our good shepherd. He promises to lead us and we can trust His leading every step of the way. Prayer requests: (1) Pray for patience, as we wait on the Lord and His leading, (2) Pray for peace, as we remember our God promises to lead us when we rely on Him. The Lead Pastor Search Committee has accepted the momentous responsibility of leading our church family through the selection process and transition to a new lead pastor. The committee is fully aware of the weight of this responsibility. That is why we feel it is our primary job to first pray. And that is why we are asking you, our friends and co-followers of Christ, to pray alongside us. God is not in the business to turn us down when we seek His will. This is why it is so important to seek Him first. In 1 Kings 3, Solomon asked God for a “discerning heart...to distinguish between right and wrong.” God was so pleased that Solomon asked for discernment and wisdom, that he blessed him greatly, beyond more than he had asked or imagined. It is our prayer to ask Him to bless our church and guide us in finding the man He has planned to lead our church. Prayer requests: (1) Pray that our committee will hear God’s voice with clarity and feel, (2) Pray for His peace as we move through the next steps in the process, (3) Pray that we place the church’s needs and desires above our own, (4) Pray that God’s good and perfect will be done. Change is coming. It’s inevitable, it’s always hard and many times it brings fear and uncertainty. But with loving guidance, clear and consistent communication and fervent prayer, our church family can come together to walk confidently and assuredly into the future. This journey in which we are about to embark upon, reminds me of the story of Noah. I’m not talking about the part of the story in which God is going to wipe out the entire human race! No! I’m referring to how confused and lonely and scared Noah must have felt upon hearing what he was supposed to accomplish. God had asked Noah to do something that had never been done before. He asked Noah to completely step out of his comfort zone. God asked Noah to conquer an extraordinary task. And as I read the story again, I can’t even begin to imagine the unknowns and unfamiliarity that Noah must have felt. And yet, he started his journey by putting his trust in the Lord. He then put one foot in front of the other. Next, he cut down that first cypress tree to make the first of many wood planks. And finally, he gathered his family and set about on the promise of his God. Likewise, we, as a church body are embarking upon the unknown. We have had 40 wonderful years of great leadership and teaching. Prayer Requests: (1) Pray for unity and fellowship within our congregation, (2) Pray for Pastor Mark as he transitions to a new normal. And praise for his legacy and ministry these many years, (3) Pray for the Search Committee to keep the Mission and values of our church at the forefront of this process, (4) Pray that no personal agenda would surface, but only the will of the Lord, (5) Pray that we will seek His will and what He has next for First Free Church. God has put all things under the authority of Christ and has made him head over all things for the benefit of the church. And the church is his body; it is made full and complete by Christ, who fills all things everywhere with himself. Ephesians 1:22-23. Q: Is there a timeline for Lead Pastor transition? Of course, the timing for this is all in God’s hands, but we anticipate approximately 12 months to bring this transition to completion. This timeline began in October 2018 with Pastor Mark’s Sunday morning announcement of this transition. We are moving through this process very intentionally so there will be minimal disruption to our church and its ministries. And we want to take the appropriate time needed to find just the right person. Pastor Mark will continue as Lead Pastor until our new Lead Pastor is placed in active ministry. Q: How will we select a new Lead Pastor? Vanderbloemen Search Group has been hired to ensure that our Lead Pastor search process is comprehensive in nature and professionally-conducted, and that all Lead Pastor candidates are properly and thoroughly vetted. This search process is now underway. (See recruitment video below.) From candidates received through this search, Vanderbloemen Search Group will recommend a pool of candidates to the Search Committee. The Search Committee’s responsibility is to screen and interview these candidates and then recommend (along with our Elder Board) one Lead Pastor candidate for our church family’s consideration. A congregational vote will determine whether or not this candidate is approved by our church for the new Lead Pastor position. Note: We welcome members of our own First Free Church staff to apply for this position. They will go through the same interviewing process as the other candidates. Q: What are we are looking for in a new Lead Pastor? We are looking for a Lead Pastor who will carry on our First Free Church Mission and Vision and embrace the EFCA movement of which we are a part. We will seek someone able to connect with younger generations while seasoned enough to lead a large, multi-staffed church with a diverse congregation. Q: When a new Lead Pastor is selected, what will be Pastor Mark’s new role? Pastor Mark will continue as a full-time pastor on our staff whose responsibilities will include the following: (1) To further develop the care ministries of First Free Church including hospital visitation, visitation of those unable to attend church, and equipping others to assist with the caring ministries of our church. (2) To help with our EFCA denominational ministry by caring for pastors in crisis. (3) To work with regional churches in helping to develop their care ministries as well as offering preaching and teaching support when needed. Q: How will our church staff be impacted by this transition? Hiring a new Lead Pastor can mean change. Our new Lead Pastor will have the responsibility to evaluate the current structure and make-up of our church staff. We expect him to take the time to discover the gifts and talents of our current staff to consider how and if they should continue as part of our journey forward. He will have the authority to make final hiring decisions regarding our church staff. Q: How can our church family be supportive through this transition? This is one of the most important decisions our church has made in the past 40 years. We want to demonstrate the power of Christ’s love as we celebrate this transition and look ahead with joyful expectation to the future of First Free Church. The biggest help you could provide would be to pray. Pray for wisdom and discernment for our church leaders and those directly involved in the Lead Pastor search process. Pray that we manage this transition well. Pray for peace and unity as we seek to glorify God through this transition. Q: What should I do when I have questions? We want you to know that we hear you. If you have questions not addressed here regarding our Lead Pastor transition, feel free to reach out to any of the members of the Search Committee or our Elder Board. There will be a table in foyer on Sunday Mornings to talk with a member of the Search Committee. You can also e-mail your questions to the Elder Board or the Search Committee. 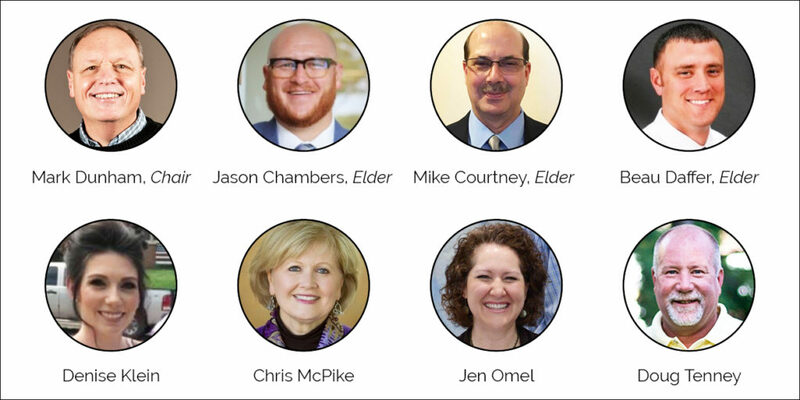 A search committee comprised of five individuals from our congregation and three Elders has now been established. They will work directly with Vanderbloemen Search Group and will begin meeting with them this weekend. The members of the Search Committee are: Jason Chambers, Mike Courtney, Beau Daffer, Mark Dunham, Jen Omel, Doug Tenney, Denise Klein and Chris McPike. Since our last update, our Elders have been giving much time to research, study, deliberate and pray about a healthy process for our church to select an individual who will succeed Pastor Mark Brunott, our Lead Pastor for over 37 years. Realizing the significance of this transition, the Elders have elected to employ a nationally-recognized, Christian search firm to ensure a process that is comprehensive and professionally-conducted, and in which all candidates are appropriately vetted. After seeking recommendations from other churches and our denominational leaders, a list of firms noted for their success was narrowed and then representatives from two of them were interviewed by our Elder Board. Ultimately, Vanderbloemen Search Group based in Houston, TX was unanimously chosen by the Elder Board to guide First Free Church through this process and to facilitate our search. In the upcoming months, the staff of Vanderbloemen Search Group will be interacting with our church leaders to help us create a profile of our church and then provide support to our search committee as they actively begin the search. To learn more about Vanderbloemen Search Group, visit vanderbloemen.com. To create a framework for a healthy search process, our Elders have been actively seeking advice from multiple sources such as the leaders and staff of other churches who have or are going through this process, Free Church denominational leaders, church consultants, and respected authors who have written on the subject. Additionally, per our church by-laws, our Elders are now working to establish a search committee from within the congregation that will, practically speaking, carry much of the weight of the search process itself. This committee is expected to be formed by mid-January. More information will be posted here at that time. In 1978, Pastor Mark Brunott started his ministry at First Free Church as the Youth Pastor. In 1982 through a God-orchestrated chain of events he transitioned into the role of Lead Pastor. Because of the faithfulness of God and the willingness of the congregation to sacrifice the resources entrusted to them, the church has grown spiritually and numerically, in the scope of its global outreach, the expansion of its local ministries and even the size of its physical facilities. Many lives have been transformed into the image of Christ through the faithful preaching of God’s Word and God has blessed First Free Church financially to bring us to the place where we are debt-free and positioned to reach more of Lincoln with the Good News of Jesus Christ. Pastor Mark believes now is the time to pass the leadership baton to the next generation. As he prayed along with the Elders it became clear that this was, in fact, God’s leading and that this is a good time in the history of our church to seek out a new man for the role of Lead Pastor; someone who can build on our current foundation and continue to move First Free Church and its future generations forward. It is vital to note what is not changing. Our mission of introducing people to Jesus Christ and developing them into fully devoted followers and equipping them to reach their city and world is not changing. Our vision and core values are not changing. Our doctrinal statement and commitment to the Evangelical Free Church of America (EFCA) is not changing. Our commitment to be biblically-focused, to teach the Word, and to be an outward focused ministry with an emphasis on everyday outreach is not changing.